If some people are said to have a green thumb, Homer Fulton had nothing less than a green arm. He could grow any kind of plant anywhere, make flowers bloom in the winter, and even grow grapefruits in Minneapolis. When news spread about Homer's talents, he was booked on The Today Show. As he left home for New York, plants, bushes, and flowers were growing spontaneously wherever he walked. "Welcome to The Today Show," said Matt Lauer, as a rose bush began sprouting from the top of his head. "To what do you attribute your amazing power?" "Darned if I know," replied Homer, "but I wish it would stop. I'm allergic as hell to all of it!" We'll leave Homer sneezing away in this, my weekly contribution to the Friday Fictioneers based on the picture prompt above. The other Fictioneers are also blooming with ideas, but hopefully none to make you sneeze, if you click right here. 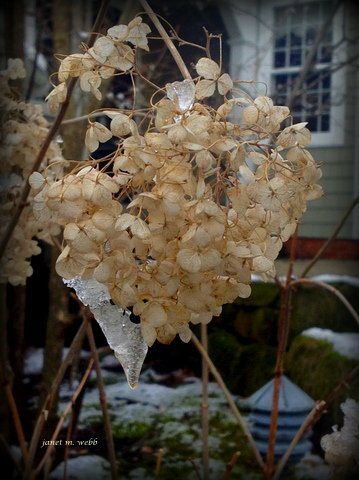 Fortunately for Fictioneers with allergies, the ice in our photo prompt should stop any stray cyber pollen from tickling sensitive noses. Great story this week, Perry. It gave me a nice chuckle. Love the idea of the rose bush growing out of Matt Lauer's head. Fun tale this week, Perry. I didn't think of that. We need Mr. Freeze to follow Homer around. Glad you chuckled, MG. I'll bet Matt Lauer likes it too. Thanks, Alicia. I think a rose as a hair-do would be an instant success.. but I would think that the thorns would be a little bothersome at night. A wacky take on the prompt that I thoroughly enjoyed. It's said that there is a fine line between a gift and a curse - that seems apt in poor Homer's case. Probably true. About the only instance in which the thorns might be helpful would be if Al Roker suddenly and unexpectedly became amorous. Fine Line?" I don't have to pay you for it, do I? That's certainly encouraging for this scribe. Thank you! Sure does! Um ... when doesn't it? Now I'm stuck with this mental image of a bush growing out of Matt Lauer's head. I'll never see him quite the same way. Thank you for that. Truly one of your funniest. You got me with the rose bush... Still laughing (and sneezing) here. Well done. I love the playful tone of this one. It as like the opening of a wonderful story, and I wanted it to continue! Nice job, Perry. Lovely. Someone should give him some weedkiller for Xmas. And a pair of secateurs. Homer puts Rogaine to shame. I can't wait for the infomercials to start. I predict this will be more popular than Chia pets. Do you think he's related to the Jolly Green Giant? I think Matt could use a rose bush on his head. Sure! Such a fun take, Perry. I didn't sneeze once. This was just wonderful! Thanks so much for sharing, it made me laugh on a day I needed to smile. Thanks, Rochelle. I'm going to start modeling one of those rose bushes myself sometime soon. You'll never see me quite the same way either. I hope you're not really sneezing. I didn't mean for Homer to be THAT powerful! Thanks, Dawn, but I think I was at the end of its wonderfulness.There would have been a precipitious decline in wonderfulness by the time Al Roker starting growing stuff. I think I'm going to have you write the second half to all my stories from now on, Nan. Great job! Patrick, I learned a new word. Thanks! Bless you. I'll try to hand you some free stuff down the line too. I hadn't thought about that. I've got to bottle Homer and rub him on my head. I'll just have to clip the thorns like I do toenails, and there's roses for all the ladies! Just you wait, Amy. You will! Homer, Matt, and I are glad we could help! How do I manage a winner every time? You can't be reading the non-Friday Fictioneer posts to say that! But thanks anyway! Wonderfully funny. It's a little like the King Midas syndrome, although Homer didn't bring it on himself. I really like this. Thank you, Susan. Now I know what to get you for the holiday. A M-m-m-m-m-att! Yeah, I guess it is like that. If I had my choice I'd go for the gold, as long as I had someone like Homer to feed me. Thanks for writing!